Corals are able to build large reef structures in many of the worlds shallow tropical environments because they contain symbiotic micro-algae called Symbiodinium (and often referred to as zooxanthellae). 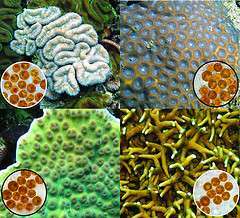 Distinct symbiont species which are found in different corals look nearly identical. (Phys.org)—For nearly 260 years—since Carl Linnaeus developed his system of naming plants and animals—researchers classified species based on visual attributes like color, shape and size. In the past few decades, researchers found that sequencing DNA can more accurately identify species. A group of single-celled algae—Symbiodinum—that live inside corals and are critical to their survival—are only now being separated into species using DNA analysis, according to biologists. "Unfortunately with Symbiodinium, scientists have been hindered by a traditional morphology-based system of species identification that doesn't work because these organisms all pretty much look the same—small round brown cells," said Todd LaJeunesse, assistant professor of biology, Penn State. "This delay in adopting the more accurate convention of identifying species using genetic techniques has greatly impeded progress in the research of symbiotic reef-building corals, especially with regard to their ability to withstand global warming." LaJeunesse and his colleagues looked at Symbiodinium that previously had been grouped together as subsets of the same species. They report their results in the current (Sept.) issue of the Journal of Phycology. They examined specific DNA markers—identifiers—from the organisms cell nuclei, mitochondria and chloroplasts. Even though the symbionts appeared very much the same, except for their size, genetic evidence confirmed that the two are different species altogether. These findings indicate that hundreds of other coral symbionts already identified with preliminarily genetic data are also distinct species with unique ecological distributions. "The recognition of symbiont species diversity should substantially improve research into reef-building corals and facilitate breakthroughs in our understanding of their complex biology," said LaJeunesse. He began his work of classifying Symbiodinium using genetic techniques as part of his research into their ecology and evolution and in later studies of coral bleaching events related to global warming. "Knowing exactly which Symbiodinium species you're dealing with is important because certain species of Symbiodinium associate with certain species of coral," he said. "Although many corals are dying as a result of global climate change, some may be able to survive because they associate with Symbiodinium species that are better adapted to warm water temperatures." Probing Question: Is it possible to save coral reefs?